WASHINGTON (AP) Los Angeles Lakers point guard Lonzo Ball’s cold-shooting start to his NBA career just keeps getting worse. For a change, the Washington Wizards managed to play the sort of defense that contributes to limiting an opponent’s scoring. 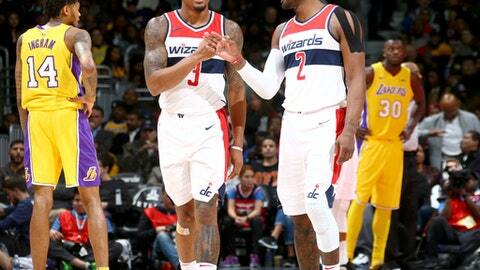 John Wall and the Wizards managed to make a double-digit edge hold up against the Lakers this time, with the All-Star point guard scoring 23 points and Bradley Beal adding 22 while Washington held Ball to 3 for 12 on field-goal tries in a 111-95 victory over L.A. on Thursday night. Ball, who had 10 points, eight rebounds and eight assists, finished the night shooting 29.2 percent so far in the pros. That’s the second-worst through a player’s first 12 games in the shot-clock era, according to the Elias Sports Bureau. Lakers coach Luke Walton’s take? Washington’s Otto Porter Jr. finished with 20 points and 11 rebounds, while Markieff Morris scored 16 points, including a pair of 3s to open the third quarter. Coming off a home loss in which they never held a lead against the NBA-worst Dallas Mavericks, the Wizards went up by as many as 21 against the Lakers, at 91-70 on Porter’s turnaround fadeaway jumper with about 75 seconds remaining in the third quarter. When these teams played each other in Los Angeles last month in the fourth game of the season for each, the Wizards led by 10 points entering the fourth quarter before the Lakers wound up winning 102-99 in overtime. This time, L.A. pulled to 93-84 on Julius Randle’s two-handed slam with about 8 minutes left. But a 3 by Beal soon built the hosts’ advantage back to 15. Defense has seemed to optional at times for the Wizards this season. But they held the Lakers to 36 percent Thursday. Lakers: Seven players scored at least 10 points apiece, including Brandon Ingram, Kyle Kuzma, Kentavious Caldwell-Pope, Jordan Clarkson, Julius Randle and Brook Lopez. … Came in averaging an NBA-high 56 points in the paint and 16 of their first 20 points came that way Thursday. L.A. finished with 48. Wizards: Centers Marcin Gortat and Ian Mahinmi combined for 10 points and 11 personal fouls in 44 minutes. There was plenty of Wall vs. Ball hype leading into that one – initially fueled, not surprisingly, by Ball’s father, LaVar – although their matchup never become the game’s focus. Wall’s night included a resounding lefty dunk over Lopez that Wall said showed his recently sprained left shoulder – which had strips of black tape on it – is doing OK. ”That was my testimony to say it’s cool,” Wall said. At the defensive end, he had a couple of his trademark chase-down blocks, including one on Ingram that drew a roar from the sellout crowd of 20,356. ”He might be the best ever at doing that,” Brooks said. Lakers: At Milwaukee on Saturday night. Wizards: Host Atlanta on Saturday night.